Friday, December 21 will be the shortest day of this year. At 22:23 UTC, the sun will “stand still” at its lowest point, exactly overhead the Tropic of Capricorn. It will then “turn around” on the horizon, and start the journey towards its highest, northernmost position reached only on the Summer Solstice. We are approaching the threshold of the Winter season. After a few longer nights, we will climb out of darkness and embrace the birth of a new astronomical year. Celebrated since antiquity as a sacred time, the three days of the Winter Solstice, the Sun lingering in its most southernmost position, call us towards inner silence and ceremonial times in community. Festivals of light, glittering decorations, candles burning on window seals, streets illuminated with wreaths and garlands reflect our need to shake the long nights of winter and hail a new beginning. But this intense commercialization of the Holy Days pulls us towards social and family events mixed with shopping and the consummation of large amounts of food, distracting us from the deeper meaning of the season. With their gifts and drawbacks, the holidays draw our attention mostly towards the external, even when the season’s spirit of generosity invites us to support those in need with donations of goods and time. Take a moment to listen carefully. As the light reaches its most intense contraction, keenly feel its absence and its worth. Do not be afraid of the darkness. Turn the alignment with the movement of the Sun into an opportunity to nourish soul, mind and psyche and get readier for your world in the year to come. Seek a silence deep enough to transform the past into a wiser future through the sieve of profound reflection. From the point of view of the Life Cycle, the Winter Solstice speaks of Death, immediately followed by the (Re) Birth of Light expanding in sync with the Sun’s movement on the horizon. This is a time of contraction, of centripetal movement directed towards the core of our being inviting vision, simplification, and sharper clarity about our intentions. It is indeed a great mystery and something of a miracle, how we are drawn to cultivate the light in times of great darkness, if we only listen to spirit, stubbornly remember love, and refuse to give in to despair and isolation. To celebrate the Winter Solstice, I invite all those who have a SoulCollage® deck to harvest the light within using the cards as I describe below. If you do not have a SoulCollage® deck, you can modify the activity by journaling every day in the attempt to reach for the “initiatory pearl” that every experience can reveal. You may also choose to start making SoulCollage® cards by following these simple steps. Take one step a day as indicated below (which I recommend), or take a couple of hours and do it all at once. Whatever your intuition guides you to do. 1. 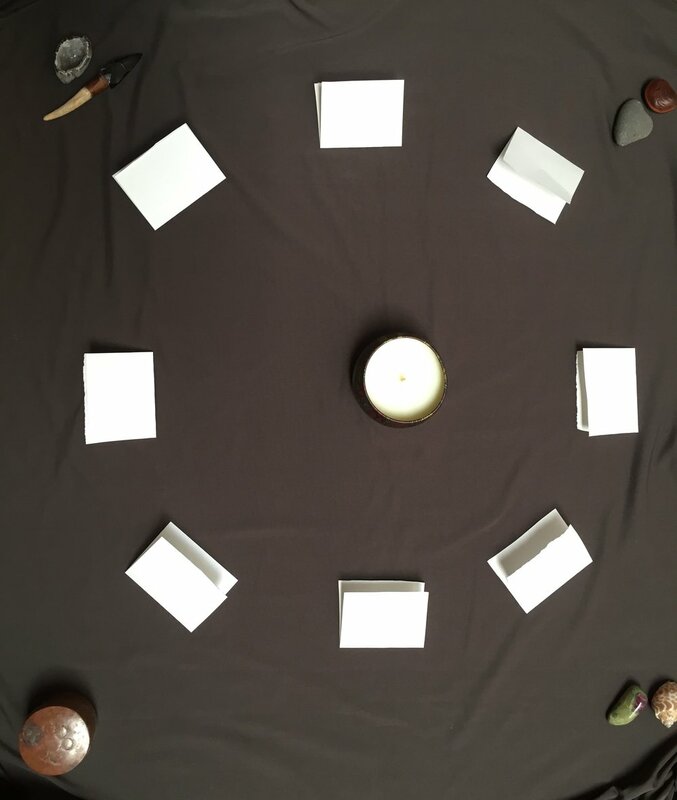 Create a sacred space where you can assemble a circle of 8 cards (your Seasonal SoulCollage® Wheel). Decorate the space very simply but in a meaningful way. 2. Place 4 significant objects in its 4 corners. If you already relate to a traditional symbolism of the 4 directions, choose objects and colors that represent them in your chosen practice. Otherwise you might choose simple colors: black and red for the South; green and gray for the West; blue and yellow for the North; fuchsia and white for the East. Or 4 objects that for you are connected to the 4 directions and help you define the space as special and sacred. 3. Alternatively, you might choose to place 4 randomly pulled cards asking the first to represent the East, the second the North, and so on. If you choose this option, do not forget to have a brief conversation with these Neters to ask them in which way do they represent each direction. 4. Place a candle in the center of this space. 1. On 8 separate pieces of paper write a few words that represent an experience you had at any time of your life (a different one on each piece of paper). Let your intuition guide you as to what experiences to focus on. It might be a success, a loss, a change, a challenging or fulfilling relationship, a painful situation, an interesting journey, or a great surprise. I would recommend that you do not include anything too current, something you might still be living and digesting. This is a process of “harvesting Light”, using your creativity and your intuition, it is not a time to process current events. 2. Fold them and place them in a circle around the candle.  How does this experience reinforce my willingness to give and receive love? 4. Write it down on a clean page of your journal, or select a new journal for the coming year. 5. Now it is time to pull 8 cards from your deck, one at a time. Connect first with the piece of paper your intuition guides you to and randomly pull a card and place it on the paper face down. 6. Continue counterclockwise, until you have 8 cards face down creating a wheel around your candle. 1. Each day, at your appointed time, light the candle and turn over a card. If needed let the Neter say a few words about itself so you may reconnect with its identity and message. Then ask this Neter to tell you about what to harvest from the experience listed on the corresponding piece of paper. Record yourself speaking or journal. Facilitate yourself into a deep conversation with this Neter, ask questions, respond to its words, mine for more depth. 2. When your conversation is over, you may blow the candle or let it burn all the way down (if safe), and prepare another candle for the following day. Today you will pull a card and place it in the center of your Seasonal SoulCollage® Wheel. If you set a special alarm, it will be easier for you to remember to rise with the sun (at least symbolically) and remember the sacredness of the moment even before your feet touch the ground. 1. Let yourself shake the density of the long night, and invite in a sense of light and joy. Wake up tuning into the north bound movement of the Sun. 2. As soon as possible, even before breakfast if you can, go to your sacred space and pull a new card. Place it under or next to the candle in the center of the Seasonal Wheel. 4. On a new page, list the 8 teachings you have harvested summarizing them in one or few words each. 5. Take your pen and journal and ask that card to give you a vision for the new year. Ask this Neter many questions. Investigate its gift and message thoroughly. Specifically ask this Neter about your light, the light of the new year, and what to pay attention to so the vision may be fulfilled. You might be intrigued by the answers, or wish to learn more. In this case, formulate a question and do a 4 cards consultation of your deck (reading) to take this process a step further. Yogis used to meditate on a physical light (sun, moon, flame) to help their focus become single minded and to be better able to “harvest” the benefits of their spiritual practice, so that they may get closer to Liberation (or Enlightenment). If you have time, I recommend you conclude this celebration with a Candlelight meditation, to embed your “harvest” more deeply into your being. You may do it in silence, or listen to some wordless inspiring music. During this meditation imagine the 8 pearls you have harvested, and as you breathe the light in through your eyes, let these pearls take root in your core and become nourishment for your intentions. · Place your journal at the feet of your lit candle, in front of you, open to the list of the 8 pearls. · As you relax and focus inward, gently direct your breath and your gaze towards the flame. Let it be the center of all your attention. Let yourself get so energetically close to the flame, that you feel you are becoming it. · Try to avoid thoughts, but stay focused on the flame, notice its qualities, colors, and movements. · When you feel that your mind is calmer, close your eyes and start visualizing the flame on the screen of your visual mind. Let it be real and bright (the luminosity your find most inspiring and appealing). · Let the flame become pure light, losing its shape. · Let this light expand without losing its brightness, until you feel that your entire body has turned into Light. · In this luminous space, that is you, use your breath to invite the pearls you have harvested to appear. · Initially they will have a distinct form, but as you continue to breathe and stay focused on the Light, you see them merge with the luminosity of your being. · They augment your Light and extend your capacity to transform any experience into useful wisdom for the future. Soulful and joyous Solstice to you! May the New Year bring you love, creativity, and purpose.